Is the weather all we can talk about? Kansas is experiencing an extremely hot summer, and everywhere you go and everyone you see talks about it. I’m getting bored with all of it. I prefer to think about Maine and Seattle and my two vacations this summer. Maine was heavenly, and the best weather ever—-sunny, high in the 80’s and low in the 50’s. I was able to work on my new novel daily and was so inspired by the ocean and the wonderful Maine folks. My daughter and I took long walks, ate lobster every day, sat at the beach and collaborated on my novels. A wonderful time. Not sure if I have ever mentioned this, but my daughter, Shan, is the best editor I’ve ever come in contact with – ever. In July, I took Penny and Palmer to Seattle to visit my sister and her clan. Palmer, now ten years old, connected to his five cousins (all girls and all under ten years old) and had a fantastic time. The highlight for him was getting to tour the fire station where his older cousin Colin is a firemen. The trip went smoothly and Penny did well. It was good for her to get away and enjoy the cool weather in Seattle. My critique group has put their final editing on my new novel and now it goes to Shan for the final final. My other daughter in Lawrence, Carey, is working on the cover. So blessed to have such talented daughters. I’ll be checking in again soon—I promise to be more timely. Okay, the photo has changed along with my hair color. Frankly, I got tired of marching off to the hairdresser every month to keep that brown color in check. Soooo, I have gone natural, sort of. Grey is the new brown for me, but with a touch of blond here and there. What do you think? My daughter has been released from Meadowbrook and is now home. She has settled into a routine of outpatient therapy and once again caring for her son. I feel so blessed to have her home. Her surgeon says her recovery has been remarkable. I have finished editing the first draft of the second book in the Plane Tree series. The Cape Elizabeth Ocean Society should be ready for publishing by fall. Can’t wait to see how Penny’s life back in Cape Elizabeth changes. Stay tuned. 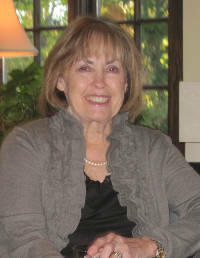 This month East Wichita News named me Writer of the Year for 2011, and I sold another Chicken Soup for the Soul story. A very good month for this gal. I must admit, this has given me an extra push to keep writing and do what I love best. I will be going to Maine as usual in June, this time taking my oldest daughter. Sitting by the ocean I’ll spend hours rewriting and polishing the Cape Elizabeth book. Can’t wait.